ISLANDS have a magical feel to them, so what better way to see and visit than by microlight. Our £299 flight to Bute is such a fantastic experience that it had tempted several people to sign up right away for a full course of lessons! As for the views, there can be few sights more spectacular than the Clyde coast and the islands from the air. 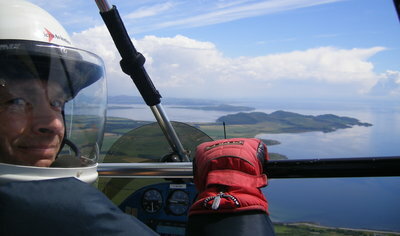 En route to Bute you will fly over Cumbrae and Millport before landing at the airfield by Kilchattan Bay. At the end of the runway on Bute there is a perfect outline of the "sleeping giant" of Arran. After taking off from Bute to set off for Strathaven again, we usually return via Helensburgh, Loch Lomond and Stirling Castle. Experience the magic of the air and isles!